When it's time to blow stuff up or get real bloody, you want an action game. These are the games that keep your reflexes sharp as you take on the evils of this world and the next. When engulfed in one of these apps, you can be a superhero, a sniper or even a battle-hardened robot. You can choose from many different action games on Google Play, so finding the most interesting game can be hard. We searched and we have for you one amazing and highly addictive action game – Neon Stunt Rider. Neon Stunt Rider is highly addictive and entertaining action game developed on android platform, giving all action lovers out there a chance to challenge themselves and become the best stunt riders. With high-quality designs and graphics, the options for making different stunts and flips while riding, various exciting environments for playing, features for collecting points and trading them for new items on the game, and much more. The game is quite challenging and addictive, allowing the users to compete among themselves becoming ultimate stunt riders. 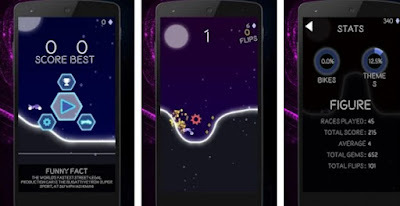 Amazing and exciting gameplay offered to all action players that use their android device for gameplaying. With 8 different environments to choose from, with valleys and hills that challenge the user to perform their stunts, the option to make insane flips and stunts for getting high scores, collection orbs for points or for trading them to get new vehicle in the game. The game offers the users 14 vehicles for performing flips and stunts, keeping them interested in the game constantly. This game is quite challenging but highly addictive, giving the users a chance to compete with other players from the whole world and get on top of leaderboards, mastering the stunt riding. Download it now on Google Play for free.